DUR-line UK 124 - Available to order, buy it now! With this new Unicable I + II LNB, up to 24 devices can be connected by just one coaxial cable. Standard JESS EN50607. Up to 24 devices can be connected to this Unicable I + II LNBvia a single cable,all at a fraction of the cost. Multi-family houses with several outlets can also be realized cost-effectively via DUR-line® 2-, 3-, 4-, 6- and 8-way distributors. From now on you will not need expensive multicasters or cascades anymore. 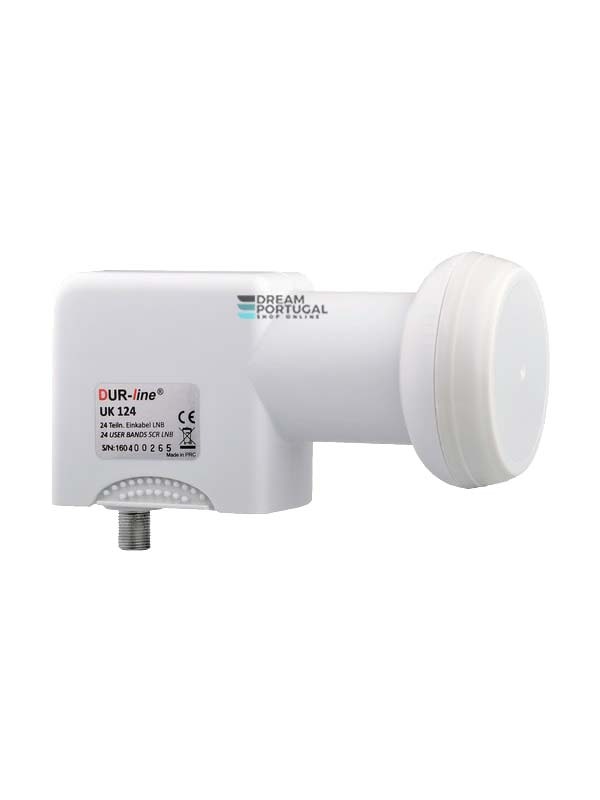 With this DUR-line® UK 124 single-cable LNB, all receivers, TV sets and twin receivers (watch one program and record another) can be operated or used at the same time, which are Unicable-compatible. The DUR-line® UK 124 is a single-cable LNB of the latest generation! The changeover takes place through the new protocol EN50607 (also called Unicable II or JESS). Up to 8 of the 24 devices can also be connected by using the widely-used older Unicable Standard (EN50494).